Here’s three stories about families who have discovered that their children have genetic issues and how they have received support and are coping. 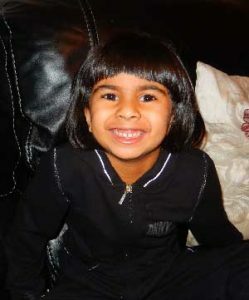 Safa is a happy sociable little girl who is always smiling. She is the middle child of five children in the family. You would not think that she was extremely unwell at birth and was not expected to live very long. Safa stayed in Manchester for 5 days. She was sedated and on a ventilator. The doctors tried to find out why her blood was acidotic so she had a MRI scan, a lumbar puncture and a piece of skin was sent for testing. These tests did not return any answers. Gradually Safa came off the ventilator and was fed milk via nasogastric tube. This lasted for 6 months when she started to take solids. She had loads of hospital admissions with the acidosis and had to have drips to correct this. Before Safa’s first birthday she was admitted to Manchester again and scheduled for surgery to remove the kidney cysts. 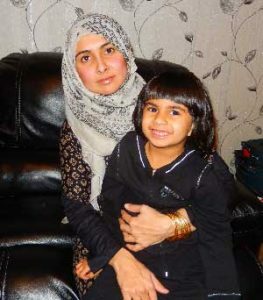 The doctors asked if they could take a sample of muscle from Safa’s leg whilst she was under anaesthetic to see if they could find the name of her condition. Then, the breakthrough! Genetic tests showed that Safa has a genetic condition which means that she can’t make enough energy from glucose. As her symptoms were similar to my brother, he has also had testing and he has the same condition not cerebral palsy. 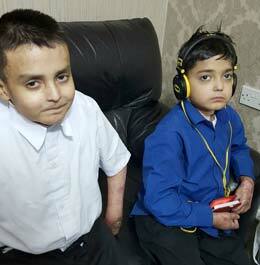 Haroon and Tauseef are two brothers who suffer from a rare genetic skin condition called Epidermolysis Bullosa (EB). They are both very kind and strong and have four sisters in their family who are healthy and well. We had three healthy girls and then I gave birth to Haroon who appeared to be a healthy baby boy weighing 9lbs. He looked so healthy and chubby, everything was normal and I was so happy. But only four hours later blisters started appearing all over his body and when I gave him his feed blisters formed around his mouth. The doctors and nurses could not understand what was happening and so the skin specialists from Birmingham Children’s Hospital were called. The specialists carried out a skin biopsy after which they gave me horrifying news that Haroon would only live for a few weeks. I was very angry, upset and struggled to accept I was being told. After eleven weeks I was given a diagnosis and told that Haroon had a rare genetic condition called E.B which affected his skin. As the days passed his skin became worse he would cry for hours and I struggled to comfort him and he was in constant pain. I desperately wanted to take the pain away from him and nursed him all the time. Feeding him was most difficult as blisters would form in his mouth and throat making it impossible for him to take the feeds. 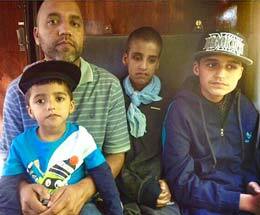 Haroon was 12mths old when he developed a very large blister on his tongue and it was obstructing his airways. In a panic we took him to A&E but the doctors and nurses were not familiar with the genetic condition, possibly because it is so rare. Rather than treat him they began to ask me questions around how this had happened and told me it was a Child Protection concern. After this negative experience no matter how big his blisters became, I managed and treated them at home. When I became pregnant with my second son, Tauseef, I was not aware that he would be at risk of having the genetic condition as well. I was seven months pregnant when nurses from Birmingham sent me dressings in the post. I was very scared but tried to convince myself that it would not happen again. Due to a slow heart beat I had to have a caesarean section and as soon as I saw him I knew he was affected by E.B as he had blisters on his tiny left leg, my heart sunk with grief. After a few days at home Tauseef’s leg was badly infected and he became seriously ill and was placed on a life support machine. Initially the doctors felt that he will not improve but over two weeks he gradually began to respond. This was an extremely stressful time as Haroon was only two. Over the years I have developed a good understanding of the condition and now know how this genetic condition is inherited. I have learnt how to best manage the condition taking a day at a time. Their skin is very fragile and the slightest friction to the skin causes sore blisters. The condition is very painful and affects them both on the inside and the outside of their bodies. Because their skin tears they often have serious bleeding, open wounds and frequent infections. The skin is very badly damaged and blisters form which need to be pierced and dressings applied. As you can imagine it is a very distressing experience for my sons and me as a parent. I don’t think there is anything worse than to see your own child suffering all the time. The condition does not improve and it is both emotionally and physically draining. I have to ensure that they receive the high level of care to minimise infection attempt to try to make them as comfortable as possible. This means they need to have a rigorous routine dressings changed and baths three times a week. As they are getting older their care needs are becoming more complex both Haroon and Tauseef have amazing personalities and a good sense of humour. They desire to have a normal life and be able to participate in sports and leisure activities but fully understand their limitations. The genetic team visited my home several times and supported me to share this information with my healthy daughters. She helped me to explain what a genetic condition is, and that although the girls do not have the condition, they may carry a gene for it which could be passed on to their future children. My girls now understand why it is important that they have the blood test to see if they are healthy carriers and are aware that we can also test potential partners too. The appointment in the genetic clinic has helped me to understand why and how this has happened to my sons. At the appointments I was able to ask questions and get a better understanding of how this had happened and what it may mean for my other children. The genetic counsellor spoke in Urdu and simplified the information to ensure that I fully understood and she saw us at Oldham Hospital which made it easier for us to attend. Zakir and Sabeel are two lovely and caring brothers who suffer from severe learning disabilities, visual impairment and autism. 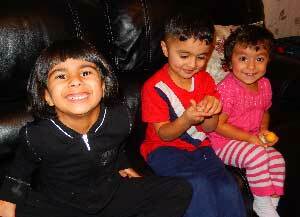 We have four children my eldest daughter Sabah and youngest son Ismail are both healthy and well. Both Zakir and Sabeel have severe learning disabilities, visual impairment and autism they need constant supervision and high level of support in all parts of daily life. When Zakir was four weeks old I began to realise that when I was talking to him he was not looking at me or giving me any eye contact. I went to see my G.P who referred him to the Eye Hospital and after lots of tests the specialist broke the sad news that Zakir had a genetic condition known as Leber’s Congenital Amaurosis and that he was blind. I was distraught it was an extremely difficult time and we struggled to come to terms with the diagnosis. As he began to grow it became apparent that Zakir was also severely delayed in all areas of his development and not reaching his mile stones. The visual impairment team gave essential advice around sensory play to aid Zakir’s development. The Children’s With Disabilities Team became involved in assessments completed by various healthcare professionals and we began to receive support and services. Zakir was only two years old when I had Sabeel, I was not aware that he was at risk of him being affected. Sabeel was only a few days old I began to see the similarities between them. It was easier for the doctors to make a diagnosis because of the family history and at this point we were also seen in the Genetics Department at Manchester Hospital. I have always been very strong in my religious and spiritual beliefs I feel that this has given me the courage and strength to cope with my very difficult circumstances. Over the years I have been very lucky to have had a very committed team of professionals who have provided support and services to our family without which I don’t think we would have managed. After ten years we decided to have another child on this occasion we were very fortunate that we had Ismail who was a healthy little boy. The Genetic Team came to see us in our home and informed us of the genetic service available in Oldham. We were not aware that our two healthy children could potentially be healthy carriers of the condition. She supported me to see the G.P and we successfully got a referral to the Genetics Clinic at Royal Oldham Hospital. She was very helpful as I did not know how to obtain this kind of service. The Genetic Counsellor broke down the information so that it was easy for me to understand. The information was given in Urdu and she understood the cultural practises so it was easy for me to be honest. I now have a better understanding of the Genetic condition that affects my sons. I feel confident that I will be able to make informed choices in the future for my children.